This CellML model runs in both OpenCell and COR. The units have been checked and they are consistent. Note that the published paper alone does not contain the full set of equations required to describe the complete model. As stated in the paper, certain equtions were taken from a previously published model (Sneyd and Dufour, 2002, also available as a CellML model). Where initial conditions were not defined in the paper, arbitary values were used to complete the CellML model description (for c, ce, R, O, I_1, I_2, S and A). The CellML model output looks reasonable, with Calcium oscillations generated, however it is likely the output does not perfectly match the published model description. There are no published figures of changing calcium concentration agaisnt time so we cannot confirm the accuracy of the CellML model. ABSTRACT: It is known that Ca(2+) influx plays an important role in the modulation of inositol trisphosphate-generated Ca(2+) oscillations, but controversy over the mechanisms underlying these effects exists. 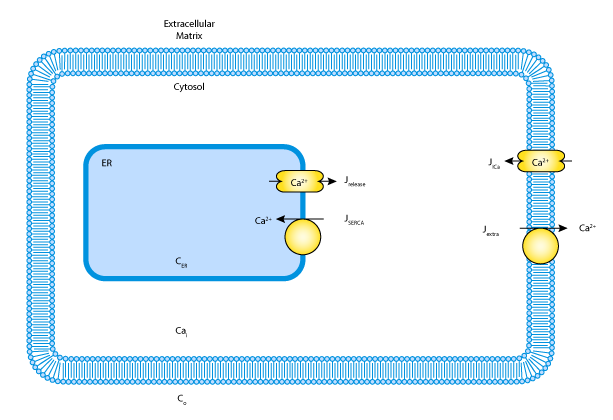 In addition, the effects of blocking membrane transport or reducing Ca(2+) entry vary from one cell type to another; in some cell types oscillations persist in the absence of Ca(2+) entry (although their frequency is affected), whereas in other cell types oscillations depend on Ca(2+) entry. We present theoretical and experimental evidence that membrane transport can control oscillations by controlling the total amount of Ca(2+) in the cell (the Ca(2+) load). Our model predicts that the cell can be balanced at a point where small changes in the Ca(2+) load can move the cell into or out of oscillatory regions, resulting in the appearance or disappearance of oscillations. Our theoretical predictions are verified by experimental results from HEK293 cells. We predict that the role of Ca(2+) influx during an oscillation is to replenish the Ca(2+) load of the cell. Despite this prediction, even during the peak of an oscillation the cell or the endoplasmic reticulum may not be measurably depleted of Ca(2+). Schematic diagram of the calcium fluxes described by the mathematical model. Derived from workspace Sneyd, Tsaneva-Atanasova, Yule, Thompson, Shuttleworth, 2004 at changeset 91f5d798acf7. Sneyd et al. 's 2004 mathematical model for Ca2+ oscillations and their control by membrane fluxes.